Well it’s over 6 months of healthy eating and gentle exercise and I’ve lost 27lbs. Slightly behind schedule but that’s not the end of the world. I’m needing to mix things up a little in the coming weeks to keep on track and build on the work I’ve done. I’m somewhat more ill with some big exertions recently like a sort of holiday and family celebrations so the exercise has dropped off and the pull of comfort eating is stronger. Especially as the weather declines and the days grow darker the lure of comfort food is strong. But I’ve come half way so I’m not turning back now. Losing the weight has made life a little easier and in some ways you could say I have more energy because there’s less of me to haul around. But it hasn’t reversed my ME. I think eating less fat has been a big boost to my system. I looked up the Swank Low Fat Diet for MS and happily discovered that I’ve actually been eating under the recommended fat levels for months now. A lot of the measures it suggests are part of my eating habits anyway with the adjustments I make for IBS. So in that respect I think my ME has been helped a little. I’ve been finding it tricky to tip the scales and measuring tape beyond my current 27lb loss into the 2nd half of my target weight loss. Hoping that mixing some things up int he coming weeks with exercise and diet might give a kickstart to that. 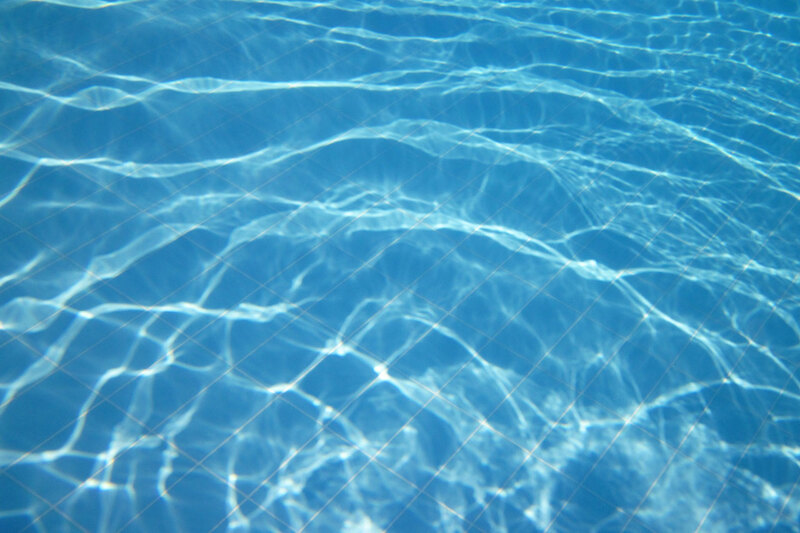 One thing I did discover was that as I had been doing more exercise (like walking or gentle swimming) I hadn’t been eating back my exercise calories leaving me with a low balance of fuel for the days activities. So I’ve been eating more on those days and that has helped. It’s certainly not easy to lose weight when your activites and diet are so restricted. Adjusting to smaller portion sizes and discovering how little fuel my body actually needs on sedentary days has been a revelation. I’ll keep chipping away and hope by Spring I’m at my target. I’m proud to announce my fundraising wheelchair push/walk is going ahead in just 5 weeks time. Push It is a 10k fundraising wheelchair push/walk for ME Research on Sunday 11 Sep 2011 in Lichfield, Staffordshire, UK. My condition means I can’t run a marathon or do a skydive to fundraise. 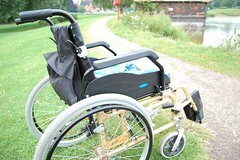 So on Sunday 11th September 2011 a team of volunteers will push me in my wheelchair over a 1o km (6.2 miles) route around Lichfield. Some will walk the full distance, others maybe just 1km (3/4 mile). Sitting in the wheelchair while being pushed might not sound like hard work for me it’s actually going to be a huge effort on my part. Due to ME/CFS I am mainly housebound and when I do go out it requires careful planning or my condition can be worsen very easily. I hope you’ll join me on my adventure and help me raise money for ME/CFS research. You can donate online or in the UK text “PUSH 50 £5” to 70070 (you can choose any amount up to £10 per text donation). So my Lovely GP administered a proper POTS test in her office as promised for me at the end of her surgery so we had enough time. My ECG hadn’t shown anything abnormal, other than having a very high heart rate (about 117-122bpm resting sitting down). I was careful not to over exert in the morning before we arrived so that my resting heart rate wouldn’t be too bonkers to begin with and the increase all the more dramatic. Except when we did the test my heart rate did not spike as dramatically as I had thought it would. It raised from a resting rate of around 107bpm to 116bpm standing after a few minutes and then there it stayed for the next 10 minutes. My heart rate was consistently high, but not high enough or a large enough increase in bpm to confirm a POTS diagnosis. What did happen however was that my blood pressure climbed from lying resting to standing. And it continued to climb over the next 15 minutes. It’s a little high when resting for my age but once I was standing it was a cause for concern and further investigation. My GP took bloods there and then, then requested they be repeated once the results came in. I’m going to have a 24 hour blood pressure monitor from the surgery next week when they’ll also take the repeat bloods for testing. I’m trying to work out a timetable for the day so that I can get a variety of measurements as it goes off every 30 minutes during the day and every hour while you sleep. So I’ll need to have some reading sitting relaxed and then for others begin standing or moving around a few minutes before the monitor goes off. Otherwise I’ll only show fairly normal readings for the sitting down and sleeping parts, when it’s being upright that seems to make it climb. I repeated the POTS test using my home blood pressure monitor the day after I saw my doctor (BP monitor very similar to the doctors) and I pretty much replicated the results of the previous day. My heart rate did climb bit only to around 115bpm over 10 minutes of standing still, while my blood pressure rose and then after 3 minutes of sitting back down my blood pressure dipped. Out of interest one weary evening I measured my blood pressure having climbed the stairs at bedtime. I felt shattered, my heart was thumping inmy chest (which it doesn’t always do when my HR is fast), I felt headachey and light headed. When I measured my pulse it was 124bpm but my blood pressure was up to 137/99 compared to 87bpm and 127/87 sitting on the sofa. Postural Hypertension or Orthostotic Hypertension (high blood pressure on standing up) does exist but is even less well known that Postural Hypotension (low blood pressure on standing up) which is not particularly well known itself! Unless my blood tests reveal an possible underlying cause, or perhaps even if they do, a referral to a cardiologist is likely the next step. Unfortunately my Lovely GP doesn’t know much about local cardiologists so doesn’t have someone lovely in mind she can send me to so it might be a bit of pot luck. If the cause is OI related will I find a cardiologist who knows about it or is willing to be open minded? 1. Orthostatic systolic hypotension where the upper number (systolic) blood pressure drops. The normal person will not drop BP more than 20 mmHg on standing up. One patient I follow with CFS had a normal BP lying down (100/60) but it fell to 60/0 on standing. No wonder she was unable to stand up – a blood pressure that low is really unable to circulate blood to the brain. In any ICU [intensive care unit] they would panic seeing a BP like that. And she was turned down for disability because she probably was a hypochondriac. 3. Orthostatic narrowing of the pulse pressure. The pulse pressure is the difference between the lower number of the BP from the higher number. For example, a normal person with a BP of 100/60 would have a pulse pressure of 40. It is actually the difference between the upper and lower number of the BP that circulates blood. If the pulse pressure drops below 18, it is abnormal and blood would not circulate in the brain well. We routinely see in our patients with CFS blood pressures of 90/80, thus a pulse pressure of 10. 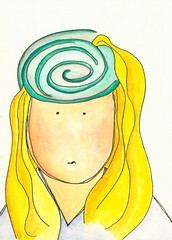 The current record holder is a young woman with CFS whose pulse pressure fell to 6 mmHg before she passed out. 5. Orthostatic diastolic hypotension. This represents a fall in the lower number of the BP, and seems to be the least frequent abnormality in patients with CFS I have tested. My variations in BP are not as dramatic as the patient Dr Bell talks about but they’re enough to give me concerns. Especially with an illness where many experts already believe that the heart is under a lot of strain. It might account for why since I’ve been taking LDN I’ve felt I have more energy but haven’t been able to maximise on that – probably because everytime I am on my feet for longer than a few minutes my BP is rising and my heart rate is too fast (I’ve measured my HR on the go up to 160bpm just doing very light physical activity like climbing a few steps slowly). Of course the high heart rate could be as my Lovely GP suggests due to enforced sedentary lifestyle and a bit of deconditioning but it doesn’t feel like it to me. I’ve stayed relatively mobile and over the last year tried to gently increase activity but keep hitting brick walls that I feel are down to tachycardia. I can’t prove it because I can’t exercise my way past my high HR And of course the high BP could have an underlying cause not yet diagnosed but the postural/OI thing is somewhat intriguing. Hopefully the 24 hour monitor will demonstrate some juicy results. Since I’ve not presented in the clincial test with classic POTS I’ve sometimes felt in danger of other ME/CFS people saying I haven’t got real ME because I don’t have POTS or a drop in blood pressure like Orthostotic Hypoptension. These are classic signs that typically accompany ME/CFS. But Dr Bell’s article re-assures me that there are different forms of OI and a rise in BP is as valid in an ANS autonomic sense as a drop in BP or big HR increase like POTS. Standing up sure can have some odd effects on ME/CFS people. I currently take low dose of Amitriptyline (30mg) for pain and migraine relief. I’ve been looking at alternative low dose anti-depressants for use in ME/CFS to help with pain and if possible aid sleep also. I apologise for lack of links to evidence for my findings. I compiled this document for personal use as I researched but it struck me it may be useful for other people, particulalry with ME/CFS, to see the list too. Where I found a tricyclic was not sedating or had a bad reputation heart wise I didn’t research it any further. If I were to switch tricyclic I’d like to try Doxepin or Trimipramine. Doxepin is supposed to be effective for IBS. eczema, chronic pain and to aid sleep – all useful for me. Trimipramine is good for chronic pain and very effective at sedating without disrupting REM sleep. Amitriptyline works well for me but I do have a fast heart rate. My GP does not think this is due to the amitriptyline as it’s such a low dose but I’ve heard from other ME/CFS people that even a 10mg dose can effect heart rate. Tricyclics like amitriptyline are sedating and good for pain. But side effects can include heart problems, although many doctors say this is not so on low doses but some patients (particularly ME/CFS patients sensitive to medications) say it does. 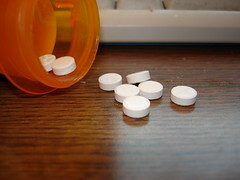 Tricyclics can interact with morphine, tramadol and antibiotics. Doxepin (Sinequan, Aponal, Adapine, Deptran, Sinquan) Sedating so useful as an aid to sleep. Can be useful for IBS (lessen gut activity and secretions). Used for insomnia as Silenor. 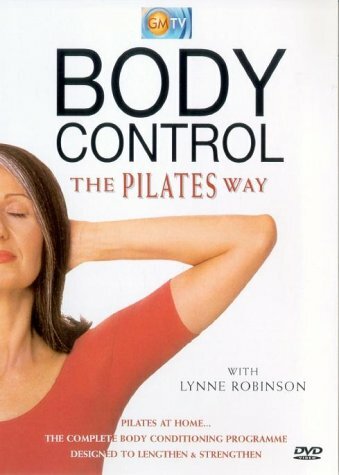 Good for chronic pain & tension headaches. Used for eczema. Helps with itching. Used in fibromyalgia. The typical dose is 10-50mg daily. Trimipramine (Surmontil, Rhotrimine, Stangyl) is the most sedating tricyclic. More effective sedation as aid for sleep than amitriptyline and it doesn’t suppress REM. Good for chronic pain. Typical dose is 5-75mg daily. Duloxetine (Cymbalta, Ariclaim, Xeristar, Yentreve) sedating. Has been studied in use for ME/CFS and a study for FMS at 60mg study showed good results. Duloxetine is thought to enhance the nerve signals within the central nervous system that naturally inhibit pain (in diabetes feet, leg and hand pain). Might cause high blood pressure and OI problems. Can cause sexual dysfunction which can persist after treatment has stopped for months or years. Trazodone (Desyrel, Molipaxin, Trittico, Thombran, and Trialodine) (SARI) Is sedating so good to aid sleep. Typcially has less side effects than other tricyclics. Effective for sleep but less effective for pain. Sometimes taken in conjuction with sedating tricyclic like Nortriptyline. Imipramine (Sormontil, Antideprin, Deprimin, Deprinol, Depsonil, Dynaprin, Eupramin, Imipramil, Irmin, Janimine, Melipramin, Surplix, Tofranil) Is not sedating. Nortriptyline (Pamelor, Allegron) Is not sedating but good for pain so can be effective combined with another sedating tricyclic. Protriptyline (Vivactil) Is not sedating. Clomipramine (Anafranil) Is not sedating. Can’t be combined with SSRI. Despipramine (Norpramin, Pertofane) Not for patients with a family history of dysrhythmias. Triptafen (amitriptyline + phenothiazine) Only tends to be prescribed short term. SSRI’s like Prozac are not as effective for pain but do energise. But this can be problematic with ME/CFS possibly due to abnormalities involving serotonin transmission. Dr Cheney urges against the use of SSRI’s and other stimulant medication as it effectively fries the brain and “taken over a period of 10 years or so, can lead to a loss of brain cells, causing neurodegenerative disorders” . But another study showed SSRI’s are effective in improving numbers of natural killer cells. Sertraline (Zoloft) in some studies show major improvement in ME/CFS. Prozac, Zoloft and Paxil (paroxetine) have been shown in controlled, blinded studies to improve autonomic function. 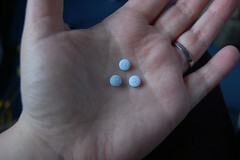 Prozac, Zoloft and Paxil are most likely to suppress libido. Venlafaxine affects serotonin and noradradrenaline levels. It activates energy levels but may interfere with deep sleep. May be effective in increasing pain levels. May possibly reverse immunological disturbances involving natural killer cell activity but other studies have shown it has little benefit for ME/CFS. Wellbutrin increases dopamine. It can be taken alone or with another antidepressant. MAOIs raises levels of noradrenaline, dopamine and serotonin but need major dietary restrictions that can otherwise produce a potentially fatal reaction. The idea of Pacing By Numbers is an interesting concept but a little controversial as some health professionals think it’s a bit obsessive. To those trying it they find it a way to quantify when and how much effort to use and it gives a clear signal when to stop. Basically you wear one of those heart rate monitors used by people at the gym and try to keep your heart rate below your AT (anaerobic threshold) which is when you start to use energy you don’t have. For me using the calculation that’s 106. Having bought my HR monitor I started to wear it to observe what my heart was doing when I was resting, sitting using the laptop, getting up to the loo, preparing lunch or a cup of tea, going up stairs and so on. I discovered my average sitting around doing things like watching telly was between 97 on a good day and 108 on a bad day. When I got up to do things, gentle things like make a cup of tea, it was up to 130-140. That’s higher than most people get when they work out. My maximum heart rate is supposed to be 160. When I went on high doses of tramadol and high strength co-codamol it was even higher and at one point walking from the car up a few steps to my brother’s front door my heart rate hit 162 at which point I stopped looking at the monitor in an attempt to relax as much as possible! Having done some research about POTS (Postural Orthostatic Tachycardia Syndrome) especially in M.E. I made an appointment to see my Lovely GP to discuss whether it could amitriptyline causing it or whether we might be looking at a POTS diagnosis. I saw my Lovely GP today and she says it’s very very unlikely the highHR is due to amitriptyline as the dose is so small. She hadn’t heard of POTS but I had printed 3 articles, a testing sheet (with CD copy) and a list of specialists for her. She was very interested to learn a little about POTS and keen to read up. I’m going back on the 17th May at the end of her surgery to do proper POTS testing so we have lots of time. She took my pulse sitting which I guessed right was 104 (she was impressed I could guess my heart rate but I didn’t tell her I’ve been wearing that heart monitor a lot!). Then I stood for like 30 seconds and she took it and it was 116. Not a POTS test but enough to both satisfy and equally fuel her interest. She said 97-104 as my average sitting rate isn’t totally surprising as I’m technically unfit from the sedentary ME thing but when I told her if I lie down and do deep relaxtion it doesn’t change she was a bit surprised and intrigued. I have an effective deep relaxation track which almost sends me to sleep and it lasts 30 minutes but even with that lying down my heart rate doesn’t seem to dip below the low 90’s. I’m booked in for an ECG tomorrow morning with the practice sister to rule out heart problems. My GP says since the NHS funding cuts and being in the new world the system is all very confusing again and it seems very difficult to do the “Book and Choose” of before where you could pick any specialist you wanted. So seeing an out of area specialist may now require an application for special funding or perhaps referral to local cardiologist then on to POTS specialist. Seeing as how most docs don’t know about POTS that seems like a long shot to me. But I did tell her that I have friends online with POTS who are being treated by their GP using beta-blockers (Propanolol being the one of choice for POTS and ME) so we could maybe do without a specilaist referral. Am stupidly excited at the prospect of trying Propanolol as I think my high HR is responsible for a lot of my “stamina” issues – why I can only stand for a few minutes or walk very short distances. I’m excited about Propanolol because I know a lot of people in the ME/CFS pacing with HR monitor Facebook group have had good success with it but not with other beta blockers. She does have a good article on POTS (from John Hopkins CFS clinic) which lists drug therapy options (including some notes from me! Like how stimulants are not advised by ME experts and the beta-blocker recommended isn’t tolerated well by ME people) so she can do her homework on other options she might think are more appropriate or not. She was apologetic she couldn’t fit me in next week so I re-assured her my heart has been fast for a long time so it can wait a little longer. And I only have to wait 2 weeks anyway! Suits me well as I have the phsyio specialist next week with my back which is a 45 minutes assessment so that’s my big task for next week. I’m relieved I don’t need to stop the amitripyline as it is very effective for pain control especially my chronic back pain and migraines. I have a little seed of doubt as to whether it could be triggering POTS but it is a relatively small dose and as it’s effective if the POTS can be treated successfully then it’s not an issue anyway. 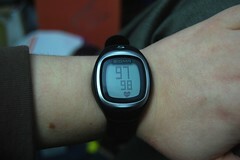 UPDATE 4th May 2011: Had my ECG today which was fun thanks to a lovely Sister even if my heart rate was a bit scarey! Hitting 129bpm just sitting down I think due to getting up early, washing, dressing and walking from the car to the consulting room. She tried to do it standing up but the signal kept cutting out so she took one sitting and one lying down. When I lay down it went from 129bpm to 108bpm but then climbed again. Not a good indication of POTS or not because I never got relaxed enough and was recovery from moving around. But definately showing my fast heart rate in action! I guess I’ll find out if there’s any underlying cause from the ECG when I see my doc again in 2 weeks. Meanhwile I’ve been told by a ME friend that just a 10mg dose of amitriptyline was enough to take her resting heart rate from an average 70-80bpm pre-amitriptyline to 100bpm on the tablets. So I think when I see the doc our first line of action should be to withdraw the amitriptyline to see what effect that has. Unless she thinks we should treat it anyway as amitriptyline has been so effective for pain and migraines for me. Plus there are other tricyclics with less side effects I could try (which are more expensive) which is something else to throw into the mix. Doxepin and Trimipramine being my shortlisted favourites to try (in that order). Doxepin is good for migraines, chronic pain and IBS and eczema as a bonus and it’s more sedating so could help more with quality sleep. I’ll have to see what the Lovely GP thinks!